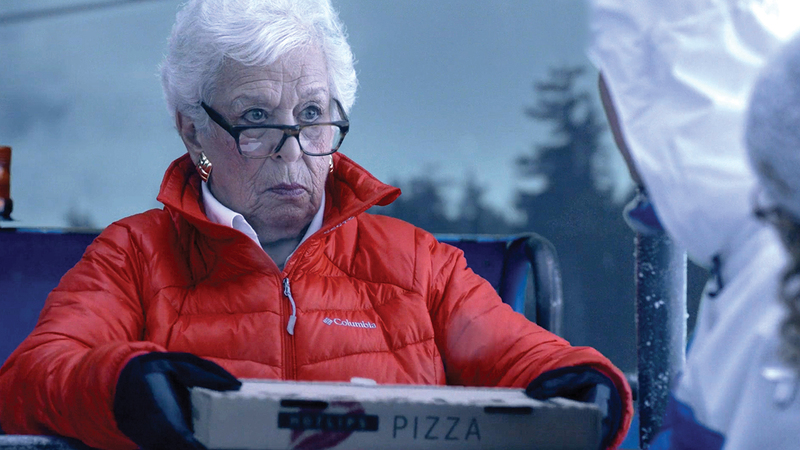 This week, Gert Boyle, the 91-year-old chairman of Columbia Sportswear, returns to the company's commercials after a decade. "It was time for us to insert some sexiness back into our advertising," she quipped of her appearance in a fall campaign from ad agency North. The lighthearted multimedia push, which kicks off this week, uses the line "Tested Tough" to stress the resilience and durability of Columbia's products. It's a campaign true to the themes of Boyle's life because resilience and durability are what this lady is all about. She and her family fled Nazi Germany and settled in Portland, Ore., where, 77 years ago, her father bought a hat manufacturing operation that formed the basis for Columbia. Boyle took the reins in 1970, following the death of her husband, who served as company president. With her son Timothy, the current CEO, she grew the outdoor apparel and footwear brand into a global force with annual sales exceeding $2 billion. Columbia's fortunes began rising after it introduced Gore-Tex parkas, which, along with other products, were touted from 1984 through 2005 in wacky TV ads starring "tough mother" Boyle and son Tim. This time, Boyle appears with a mix of actors and company employees in humorous scenarios that bring the "tested tough" mantra to life. "The company had moved away from brand storytelling," said chief marketing officer Stuart Redsun, who joined Columbia a year ago after tenures at Under Armour and Sony. "It was only focusing on a technology or a product, and you could tell from talking to consumers that no one really knew what the brand stood for." In fact, the original spots with Boyle were the only ads consumers remembered. To refocus communications on the innovative, perfectionist spirit of the company, it made sense to put her in ads again, he said. Most experts see Boyle's return as a positive. "Older women are 'in'—Joan Didion for Celine, Iris Apfel for Kate Spade—so her resurrection of the 'One Tough Mother' persona could play into this," said Michael Solomon, an industry consultant and professor of marketing at St. Joseph's University in Philadelphia. Plus, '90s nostalgia appeals to many consumers, so it makes sense for companies to leverage that trend if they can, said Matt Powell, an analyst at NPD Group. "Retro is a very important trend right now. I see no downside here," he said. What's more, an Ace Metrix study found significant plusses for brands that use corporate leaders in their ads. Wendy's founder Dave Thomas famously appeared in folksy TV spots from 1989 to 2002, making him one of the most recognizable and likeable spokesmen, which in turn helped increase the fast-food chain's sales. "CEO ads actually do work if done correctly—in general, direct, trust-inspiring messages communicate a no-nonsense style that gets viewers' attention," said Peter Daboll, Ace Metrix CEO. However, Nick Clark, executive creative director at brand consultancy The Partners, injected a note of caution: "I'm concerned when a brand feels it has to revive an icon from a previous era. It seems to lack vision," he said. "But, in its favor, it would be a distinctive approach for the category." Ensuring that today's consumers understand Boyle's role is paramount, experts said. To that end, she is identified in the spots, and Columbia's Redsun said her story would be available online and at retail locations. In addition, younger consumers will have ample opportunity to get to know the "tough mother," as she'll also appear in a spring campaign. Check out Adweek's exclusive new Q&A with Boyle here. 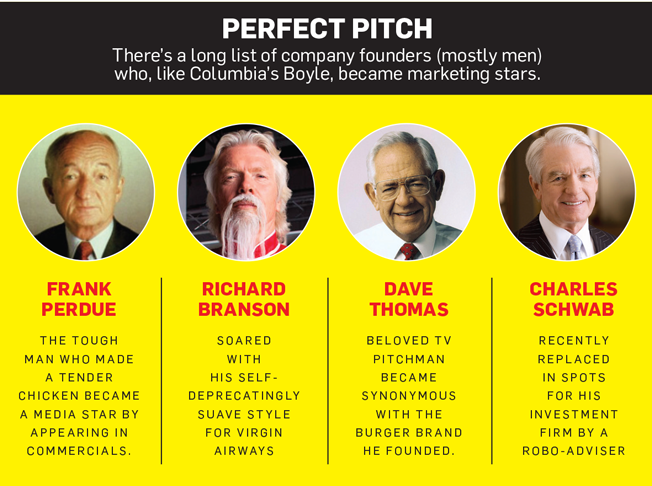 This story first appeared in the Oct. 5 issue of Adweek magazine. Click here to subscribe.